Implicit bias describes the associations we unconsciously make between seemingly unrelated factors, including gender, race, level of education, nationality, physiology, age, or geographic area, among many other attributes. With these unconscious associations, people unknowingly create mental shortcuts to aid in decision-making. However, in certain situations, a quick decision based upon unconscious associations can be lethal. The panel discussion, which took place at the U.S. Capitol Visitor Center, was moderated by Kris Marsh, associate professor of sociology at UMD, and included Reverend Tony Lee, founder and senior pastor of Community of Hope AME Church; Destiny Peery, associate professor of law and psychology at Northwestern University; Rashawn Ray, associate professor of sociology at UMD; and Henry P. Stawinski, III, chief of the Prince George's County Police Department. The nearly 100 attendees included congressional staff, law enforcement officers, and others from the public and private sectors. After opening remarks by UMD Vice President for Research Laurie E. Locascio, Congressman Anthony Brown, who co-sponsored the event, and Senator Chris Van Hollen shared their voices on the topic of bias-free policing. In Prince George’s County, Md., researchers at the University of Maryland have teamed with the Prince George’s County Police Department to study implicit bias in policing, using data, virtual reality, and physiological metrics to enhance training for all 1,700 sworn officers in the county. The new training program, which will launch in March, is the result of a multidisciplinary partnership between the UMD Department of Sociology, Lab for Applied Social Science Research, and MLAW Program; and the UMD Institute for Advanced Computer Studies. The use of virtual reality scenarios for implicit bias training make this innovative research-based program unlike any other program in the country. Because of its uniqueness, the program is poised to become a paradigm for other law enforcement agencies. 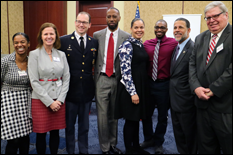 UMD’s Research on the Hill series explores timely, relevant, and critical societal issues through both a research and policy lens, providing lively and informative events featuring content experts on Capitol Hill. Past Research on the Hill events have brought academic, industry, and government leaders together to address topics ranging from traumatic brain injury to disaster resilience, autonomous vehicles to health equity.